Publisher: Shukyou Kougei Sha Co.,Ltd. 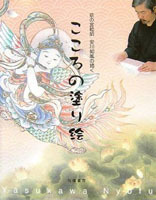 A collection of essays explaining the history of Japanese traditional ornaments from painter's point of view. The series ran in the Shukyo Kougei Shinbun from December 2007 to August 2011. This coloring book contains series of ceiling paintings including Tennin, Phoenix, Lotus, Hosoge pattern, Kuyo Bosatsu, Kalavinka, Flowers and Birds in four seasons. Purchace from links below are also avaliable. A collection of essays about the various episodes of meetings and partings and the world of painting. The essay originally ran on Chugai Nippo art page from Janurary 1998 to August 2000. 24 out of 32 series are retouched and edited for publishing. A first collection of essays ran on Shukyou Kougeisha Newspaper from September 1993 to Feburary 1996. The essays are retouched and edited for publishing. Edited by The Kyoto Shimbun Newspaper Co.,Ltd. Publisher: Kyoto Shinbun Center Co.,Ltd. Publisher: The Kyoto Shimbun Newspaper Co.,Ltd. Publisher: Oak Press Service Co.,Ltd. 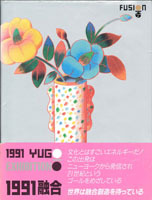 Catalog of the group exhibition "1991 YUGO" at Art Director Club Gallery, Manhattan, New York sponsored by Ministry of Foreign Affairs of Japan and Agency for Cultural Affairs.